I challenge you to take the challenges. It’s not that I ever set out to intentionally not read diversely. 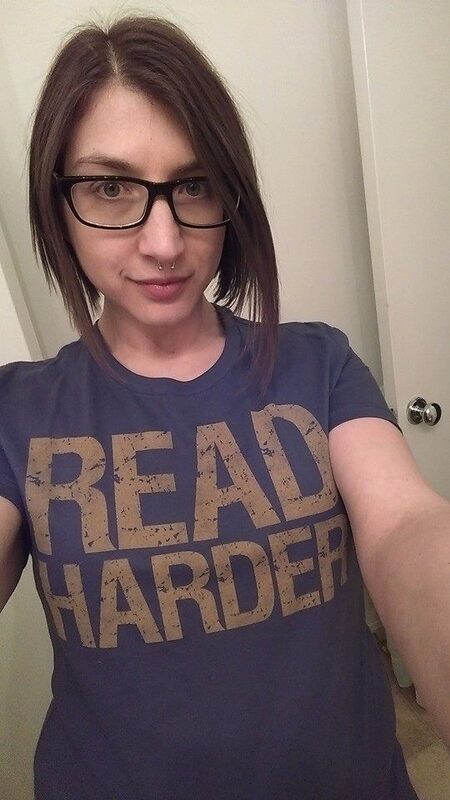 Honestly, I don’t think that is the explicit goal of most avid readers. However, as the publishing industry pushes out and publicizes their books, we are directly fed a stream of books that represent the majority. It’s unfortunate that publishing seems to be slow to add more diverse authors and therefore characters to their catalogs. In fact, there is currently a call for the major publishing houses to become more transparent regarding the diversity within. Earlier this year I was introduced to reading challenges. I really didn’t know such a thing existed aside from setting a goal of a number of books to read in a year. Most often I would base my reading on my Goodreads to-read list cross referenced with what was available on my library hold list. I started off 2015 with the Pop Sugar Reading Challenge. This challenge is 52 various topics from a Pulitzer Prize winning book to a book with bad reviews to a book written by someone under 30. At the time of this writing I have checked 35 topics off the list. With this particular challenge I decided to double up on categories if one book fit multiples. Some folks have chosen to read one book per week. One thing I enjoy about many of the book challenges I’ve seen is that they are open to interpretation. You fit the challenge items to your reading habits. The second reading challenge I joined in 2015 was the Book Riot Read Harder Challenge. I even bought the t-shirt. What drew me to this challenge was that the topics made for very diverse reading such as reading an author from Africa, a book by or about someone who identifies as part of the LGBTQ community and a book published by an indie press. I am more than halfway to finishing this challenge. I am so thankful because in order to complete the topic of reading a graphic novel, I picked up Ms. Marvel, Vol. 1 and now I am completely hooked on Ms. Marvel. 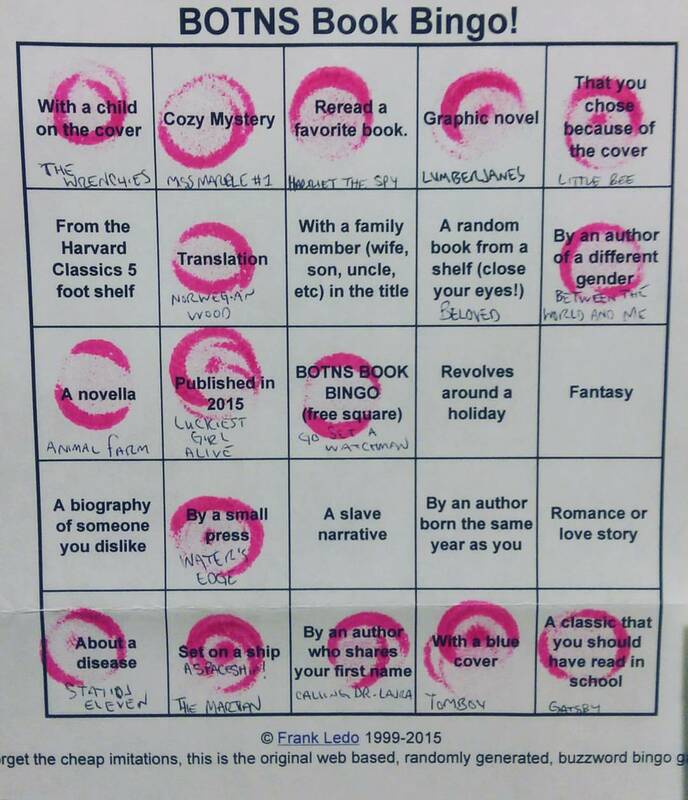 Finally, I took part in the Books on the Nightstand podcast’s Summer Book Bingo. This was a challenge where from the Memorial Day holiday weekend through the Labor Day holiday weekend, you attempted to get a “bingo” on a randomly generated card with various topics. I am proud to say that I ended with three bingos at the end of the challenge! So yes, I am highly in favor of participating in reading challenges to help push my reading along. There is a small downside, and that is I am not getting to my to-read list exactly how I wanted as I’ve had to add some extra books in there. But, I think that is a small price to pay for expanding my reading and picking up books that I never would have looked at otherwise.